S-SERIES BOBCAT Skid Steer Tires: Bobcat S-Series Skid Steers are Bobcats line of Skid Steers with Tires, and probably the most Popular Skid Steer manufactured. When it comes to Bobcat S-Series Skid Steer Tires the most trusted tire dealer is Monster Tires. Our staff here knows the construction industry and heavy equipment very well from actually working in it and running equipment. Monster Tires offers the lowest prices on Bobcat S-Series Skid Steers, call us today with any questions or to find out what different tires we have to offer for your Bobcat. Trust our Fully Staffed 9-5 Office of Bobcat S-Series Tire Experts! Here at Monster Tires, we are proud to have a fully staffed office of experts to answer all your questions about construction equipment tires. If you are looking for tires for your Bobcat S-SERIES S590, S-SERIES S570 Skid Steer, S-SERIES S850, S-SERIES S750 – S770, S-SERIES S630 – S650, S-SERIES S530 – S550, S-SERIES S450, S-SERIES S300 – S330, or S-SERIES S220 – S250, our team of experts can help you. We have choices for Rear Tire Sets for Bobcat S-Series Skid Steer, Front Tire Sets for Bobcat S-Series Skid Steer, and Sets of Four Tires for Bobcat S-Series Skid Steer. When it comes to replacement tires for your Bobcat S-Series Skid Steer, you need affordability and reliability. We have the best prices and the best quality for Construction Tread Tires for Bobcat S-Series Skid Steer. We have the Heavy Equipment Tires to get your piece of equipment rolling again. 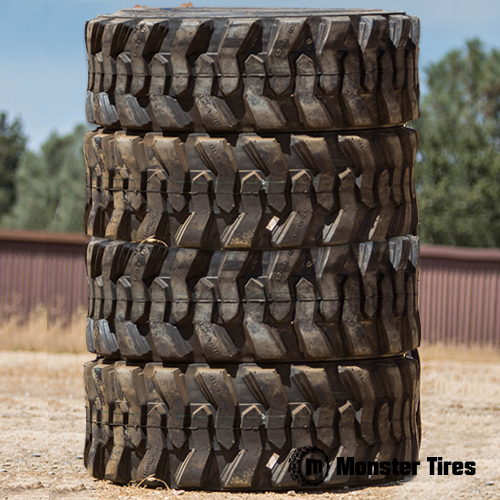 So Trust in Monster Tires for your next set of Bobcat S-Series Skid Steer tires!